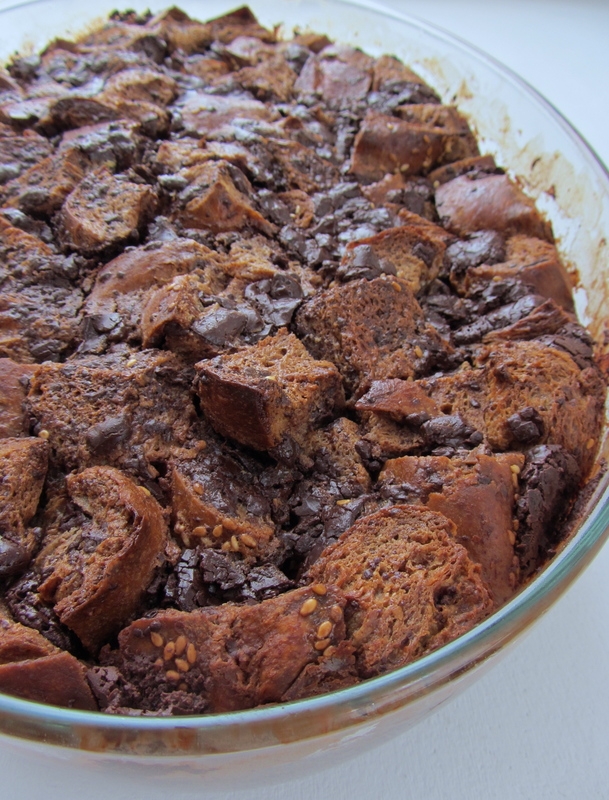 This bread pudding is one of my favorite desserts because it brings together two of my most beloved food groups: bread and chocolate! The great thing about this recipe is its versatility; the pudding can become sweeter, richer, or milder – depending on the type of chocolate used. Dark chocolate makes for a more complex pudding with a slight bitterness, while milk chocolate will have a light sweetness with a smoother finish. Often times, the best version is done with a mix of the two. Whichever way made, it will still be a winner! 1. Preheat the oven to 325F. Lightly grease a large baking dish. 2. Cut the bread into 3/4 inch cubes, enough to make 8-10 cups worth. Place them into the baking dish. 3. Cut the chocolate into chunks and sprinkle over the bread cubes. 4. In a large bowl, whisk together the half & half, eggs, vanilla, sugar, brown sugar, cocoa powder, and salt. Pour mixture over the bread cubes and let stand at room temperature for 30 minutes, pressing down on the bread occasionally with a large spoon, until the liquid has been absorbed. 5. Brush the top of the bread with the melted butter. Bake at 325F for 1 hour or until the bread pudding is set and a knife inserted into the center comes out clean. Allow to cool before serving. * Challah bread is my preferred choice of bread, but you can use other loaf breads as well. * Serve with powdered sugar, a scoop of vanilla ice cream, or a dollop of whip cream if desired.